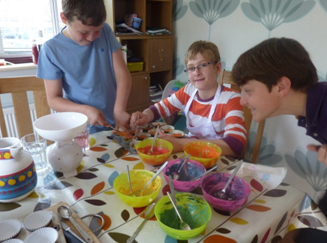 Brothers Busker & Bake to Pack for a Purpose in Costa Rica! Packing for a Purpose is often a family affair involving both adults and children. Travel is always an enhancing experience and a wonderful way to enrich children’s lives. The experience helps inform and enlarge their worldview. Pack for a Purpose traveling families often tell us about how much more meaningful their trip was by bringing needed supplies for the communities they visited. It is with great pleasure that we are publishing the blogs of two students from the UK who along with their family, Packed for a Purpose on their recent family holiday to Costa Rica. 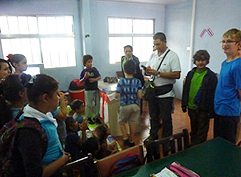 Our guide, Edwardo, from Costa Rican Trails, and our family found our visit to the Children’s Centre very humbling. It was shocking to see the parallel existence people have in the same city. We were so glad that we visited and made the effort to support Pack for a Purpose. Myself and my family will always remember the faces of the Nun and the children and the warm welcome they gave us. We know our contributions will help a little to make their lives better. We learned a great lesson in life! Dan’s blog captures the events leading up to the delivery of the supplies to the Children’s Centre, including all the fundraising ideas and experiences. At school, my class has started an enterprise to raise money so that the Children’s Centre in Costa Rica can buy new supplies. 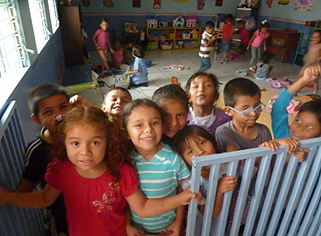 The centre, Centro de Promocion Comunitaria San Martin de Porras, is based in the shantytown in the capital, San Jõse and provides daycare for 280 children ages 1 through 12. The idea is that this will help the children there have more things to play with, help with their education, and help with the running of the centre. All of the money raised by the enterprise will go to the centre. My family is going to Costa Rica and we will be able to visit the centre. We will see exactly where the money is going. My group is raising money by making different flavoured cupcakes and selling them in a cake sale. 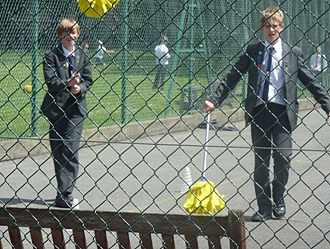 Our second idea was charging to have a go at mop football. The football would have a World Cup theme, but was more like hockey with one-on-one matches. 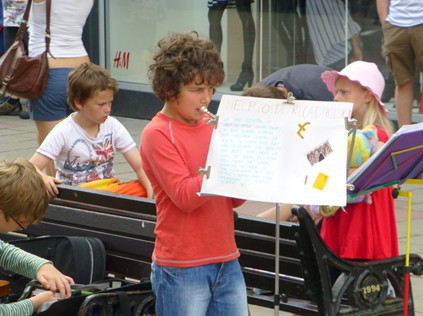 When my brother and I went into Worthing, we set up our things for busking. I started by playing an Irish Jig on my violin. Jack started with the Match of the Day (inspired by the World Cup) then Doctor Who, Fiesta, Star Wars and Human all on his trumpet. We were interrupted by the children’s parade and only made £24. We started again with our favourites and soon rounded up our total to a fantastic £79.63! 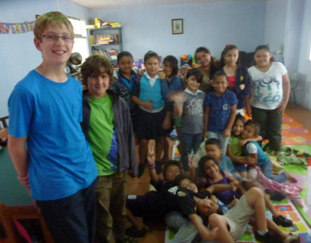 I later announced to my class that we were giving our profit to the centre in Costa Rica, that I would be visiting. The whole class cheered and we agreed to double our efforts to raise as much money as possible! I put together a box full of things to donate to the centre that we would take with us. This idea came from Pack for a Purpose (PfaP) who suggested combining holiday trips with packing useful items that can be donated locally to a charity. The box has been rapidly being filled with pencils, school supplies, and pencil cases. We presented our enterprises to the school in assembly and my group presented first. We thought the audience must be engaged since they were all silent! Our presentation went very smoothly, as did those of the other groups. The whole school seemed interested and looked like they would be keen to take part for the charity! 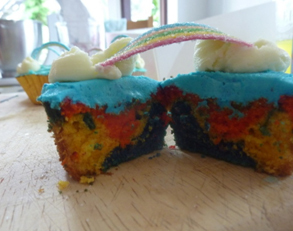 In the morning, my group quickly sold out of cupcakes with the flavours Oreo, Chocolate, Vanilla and rainbow. We made a grand total of £35.80 in just 20 minutes. In the second break, we played our mop football game which added to the total of £50.45. By the last day of our cupcake sale and mop football game, we made a fantastic £70.98! We drove through San Jõse and arrived at the Children’s Centre. The volunteers helped cook, as well as look after and care for the children—all for no pay. The nun who runs the centre then showed us the four to five year olds who were preschool age. They were all quite excited. They jumped on the nun and ran to the banister waving socks and shoes around as we entered and it was quite overwhelming. We then went to see the seven year olds who were reading and talking. We read out our letters to them which they enjoyed very much as well as giving them an England to remind them of our football prowess! We went to see the one to two year olds who were just nodding off to sleep for siesta. We went downstairs and saw the babies sleeping on blankets in a huge warehouse like building. We learnt that the government does not give them money, but that companies like Coke Cola and Pepsi do. The children are mainly sons or daughters of single mothers and the volunteers that come may be the single mothers themselves. A teacher comes every week to teach the children English. The centre is also a dental clinic. 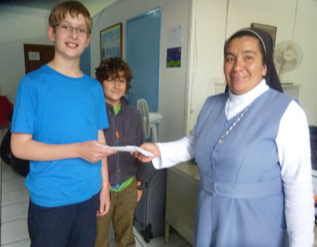 At the end of our tour, we gave the nun the money we had raised – a sum of just over $800! When we unpacked our bag and gave her the money, she was amazed. We had taken the money along with books, clothes, and dental things. She said the money would be primarily used on food and toys and to go towards a roof for the playground. We all thoroughly enjoyed our visit and we hope the centre carries on to flourish and to educate and look after the children of Costa Rica. Thank you for allowing us to enjoy your beautiful country. My brother and I have been busking and I made a poster to show that we were busking to raise money for other children in need. I played my trumpet and Dan played his violin. People were pleased to see that we were raising money for other people. We played songs such as Match of the Day for the World Cup. We also played a lot of film-themed songs which are quite popular. Dan and I busked for about an hour and forty-five minutes. At the end we had made about £70 (about 115 US dollars). 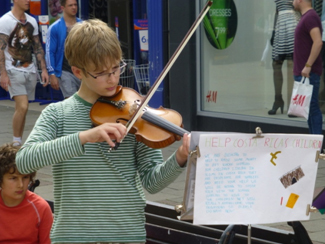 We enjoyed the busking and hope that the money raised will be helpful to the children. We are looking forward to seeing where the money will go to as we are going to Costa Rica in a few weeks, which is very exciting. When we got to San Jose, we went to see the children in the centre where we gave them all of the books, clothes, dental equipment, toys, and the money we had raised from busking and that my brother Dan had raised with the school from his cake sales. All the children seemed very happy to see us and we were very pleased to see them!